Mason bee is a common name for a species of bees. They are named from their habit of making compartments of mud in their nests, which are made in hollow reeds or holes in wood made by wood boring insects. Species of the genus native to America include the orchard mason bee and the blueberry bee. 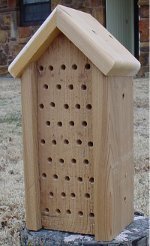 Mason bees are increasingly cultivated to improve pollination for early spring fruit flowers. Unlike honey bees they are solitary; every female is fertile and makes her own nest, and there are no worker bees for these species. Solitary bees produce neither honey nor beeswax. 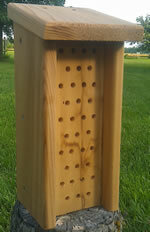 Most mason bees live in holes and can be attracted by drilling short holes in a block of wood. They are excellent spring season pollinators and, since they have no honey to defend, will only sting if squeezed or stepped on. As such, they make excellent garden "pets", since they both pollinate the plants and are safe for children and pets.